So why would you want to use propagate across sheets? For example, imagine you have a number of legal entities across your business and you want to create a organisation-standard P&L report to be used across all the different entities. That’s easily done using Propagate across Sheets – simply build the report as normal and when done, right-click on the hierarchy member you want to propagate. Choose the entities to report and XLCubed will quickly create additional sheets/workbook(s) for these. 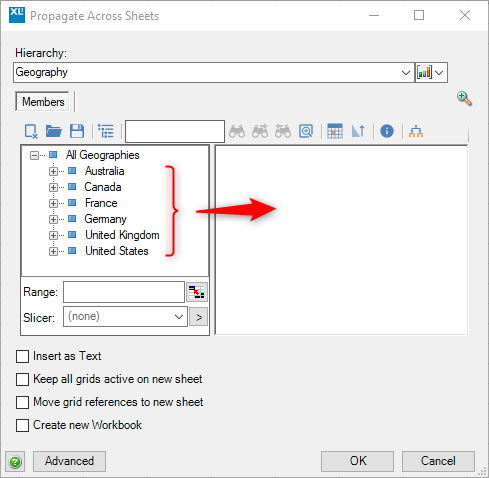 Let’s do a simple Propagate across Sheets and create a separate worksheet for each country. From XLCubed’s right-click menu > Propagate Across Sheets. 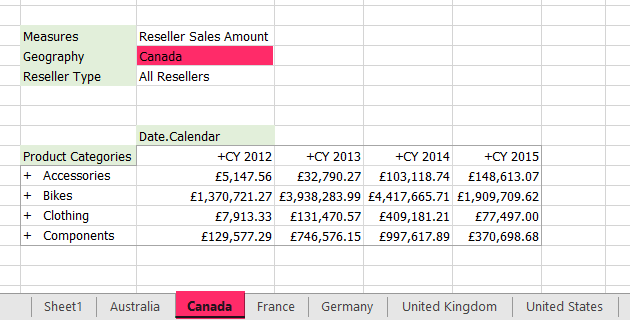 Expand All Geographies, drag selected countries across to the right and click OK.
You can see that XLCubed has created a separate sheet for each country – the grid on each sheet shows the specific sales figures for each country. Insert as Text: if a formula was right-clicked then the resulting worksheets will have all formulae converted to values. If a grid was right-clicked then the corresponding grid on the target worksheet will be converted to values. 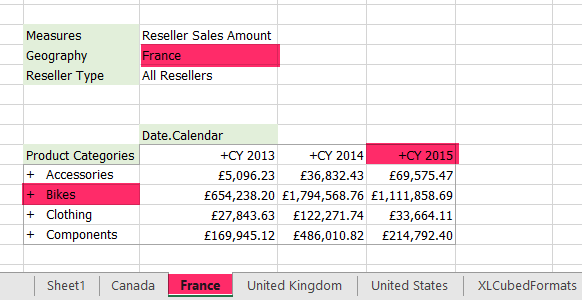 Let’s try using the Advanced tab to filter when we propagate – we have a request to produce a report that shows only those countries where Bike Sales in 2015 were above £1M. It’s that simple! We hope you’ve found this blog useful and feel inspired to try out the propagate feature when you get the opportunity. As always, we value your feedback on any enhancements we can make!